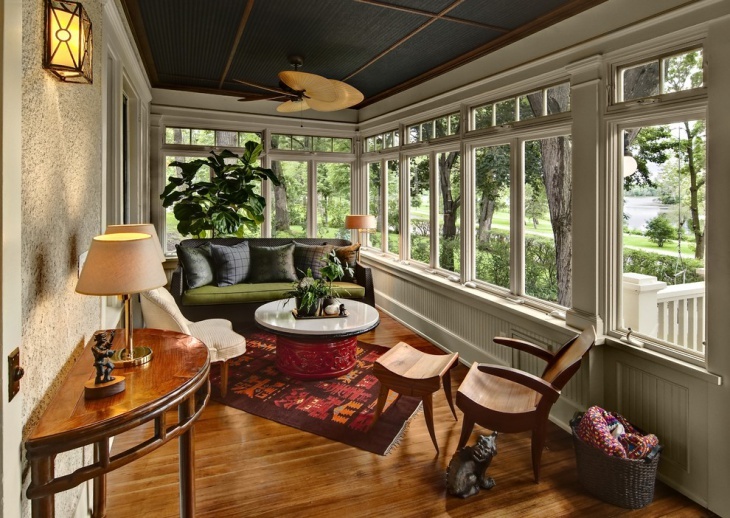 This little sunroom has the perfect furniture for the sunroom. 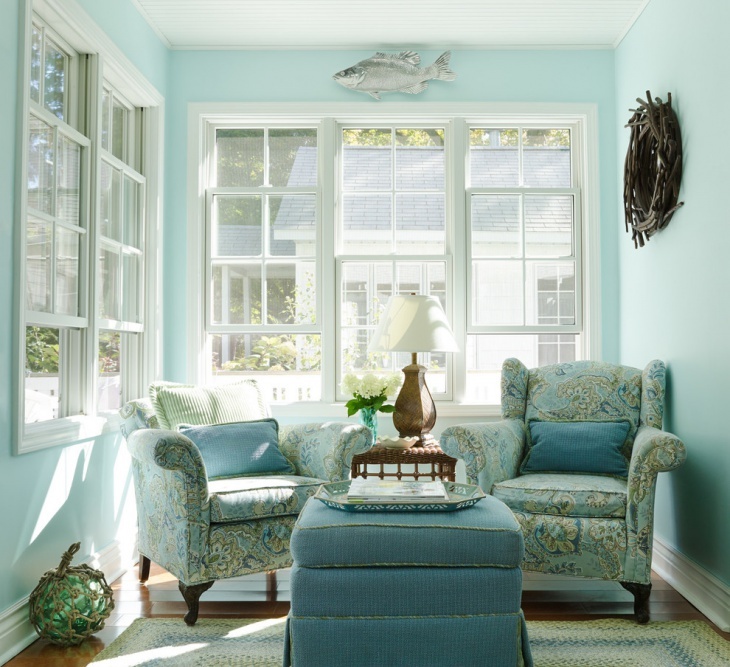 It contains sea blue colored sofas that match with the large rug placed in the center of the room alongside white windows and borders in the wall. 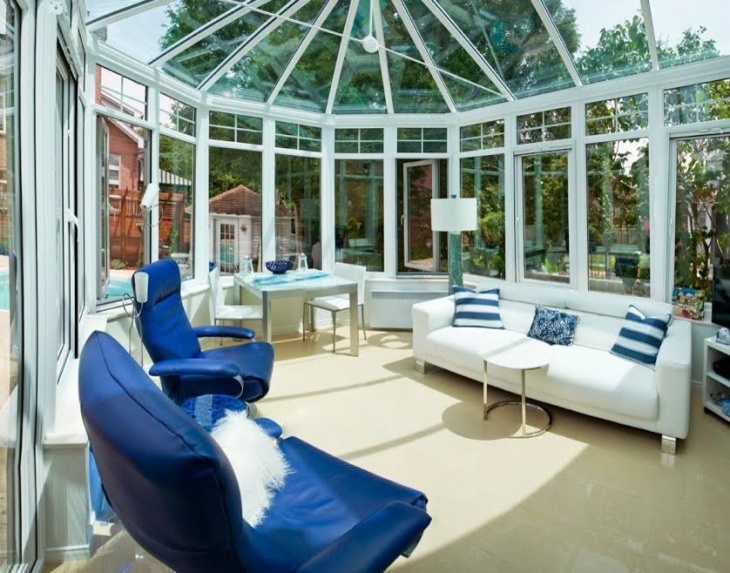 The blue and white color scheme is ideal for sunroom furniture. 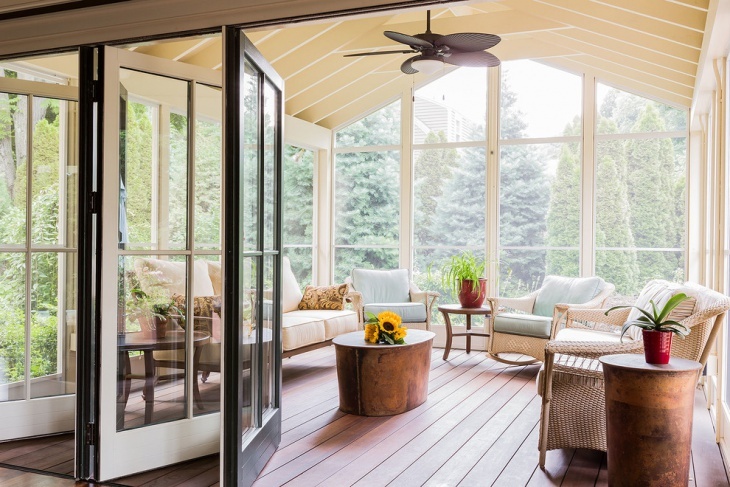 This gorgeous porch features the breathtaking view of the lakes and is surrounded by green landscapes. 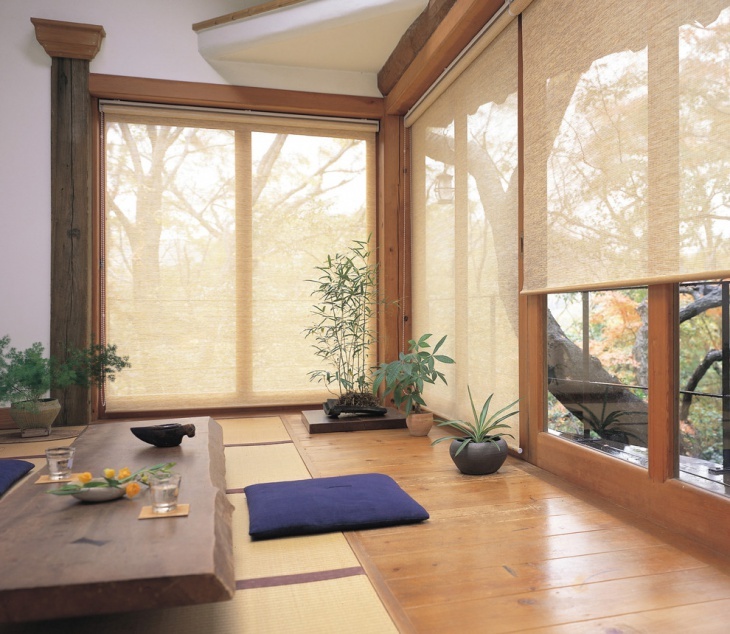 The furniture of this room is mostly wooden like the chairs and a side table along with wooden flooring. It also features green colored sofas with dark gray cushions. 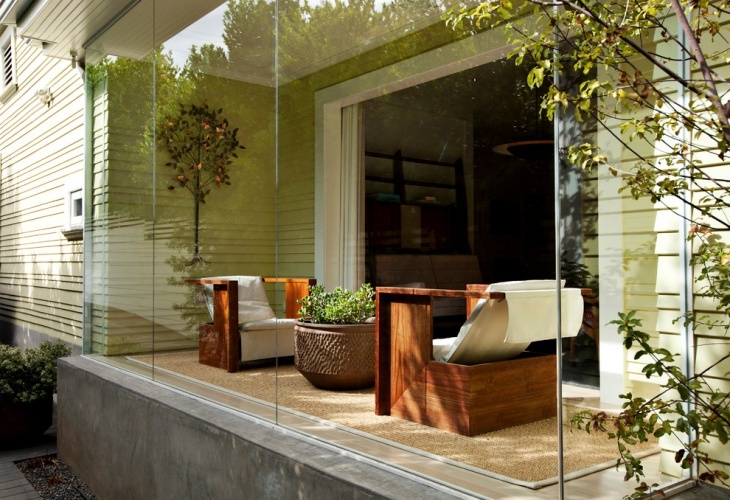 This awesome looking porch has a glass enclosure and the room features white sofas and blue armchairs. It is very large, spacious and has ceramic flooring. 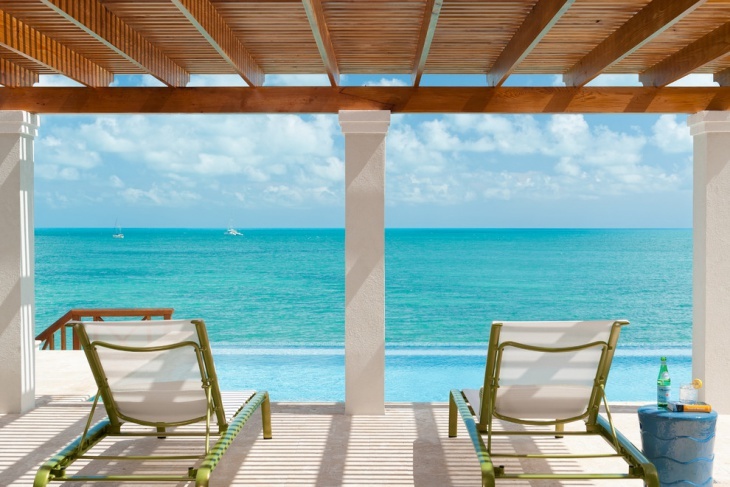 It looks like an ideal place to soak in the beauty of the greenery at the same time stay protected within. 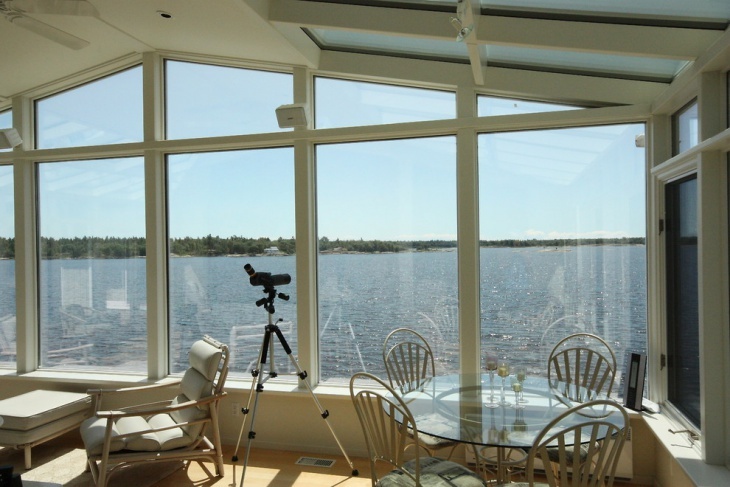 This is a traditionally styled glass porch with custom made glasses wherein the breathtaking view of the sea can be witnessed. It features white on white furniture such as a round glass table with white chairs around and comfortable armchair and other décor in white. 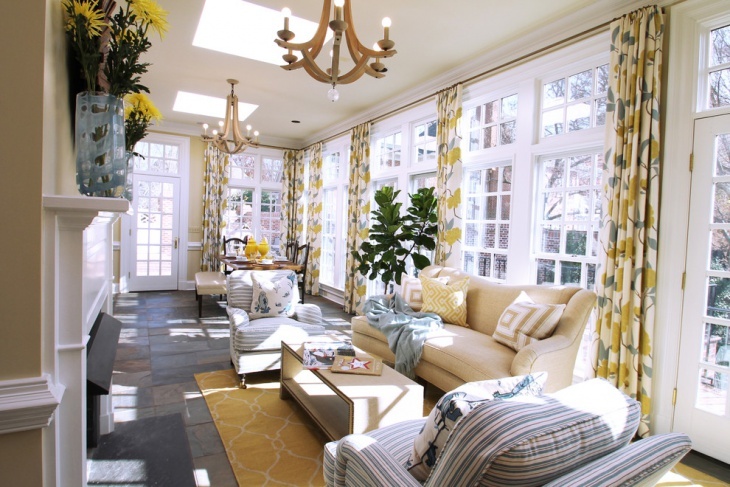 This sunroom is a large room which is completely filled with furniture, leaving absolutely little or no empty space. This room is perfect for large groups or families that intend to have casual conversations and is divided into two sections keeping in mind the privacy. 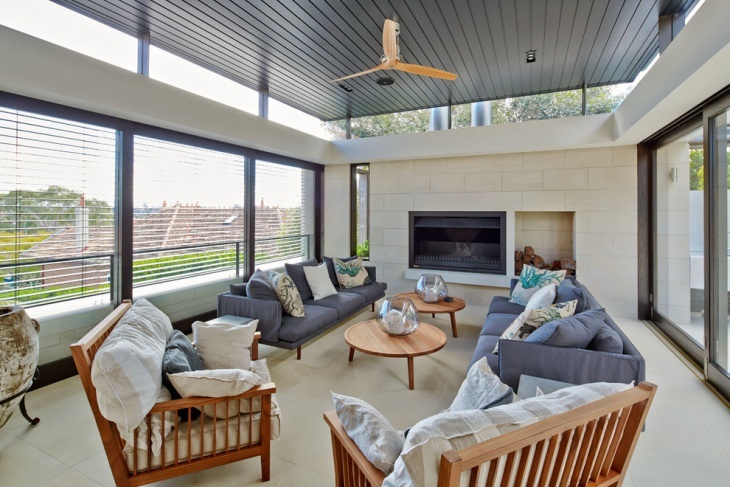 This modern sunroom design features the brick dividing ceiling wall in glossy black and has a metal based fireplace in the room. 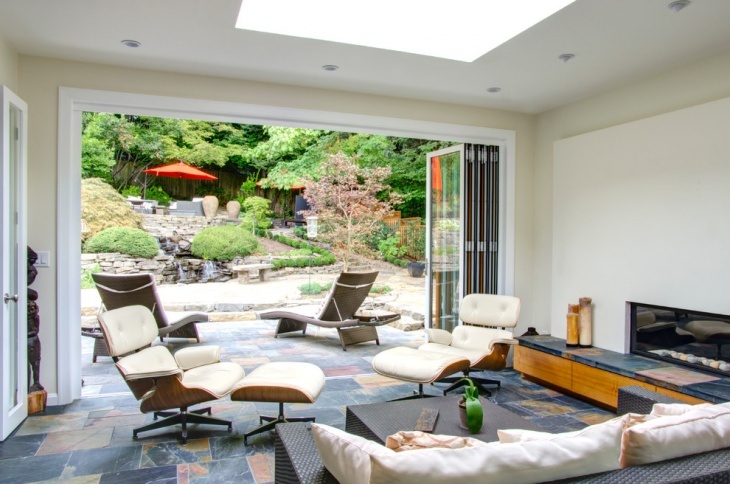 It also features two mini wooden round tables and grey blue sofas with throw pillows. The furniture color is exquisite and is suitable for midsized rooms. 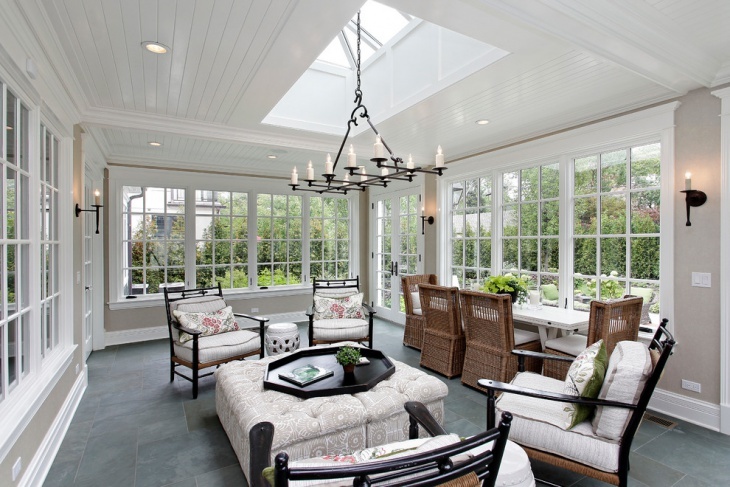 This beautiful and transitional sunroom has very nice lighting and décor that matches well with the furniture of the room. The ceiling is decorated with chandeliers that make for a lovely adornment and features off white sofas with matching cushions and curtains. 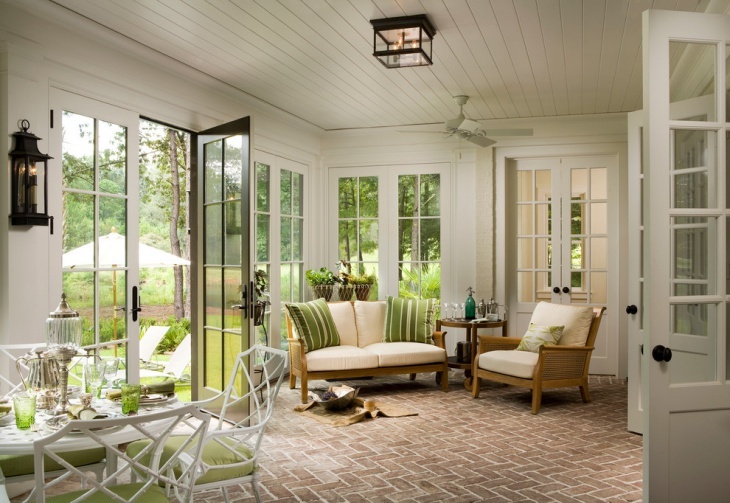 This is a farmhouse sunroom with a very unique brick paver floor design and contains glass doors in Chinese design. The flooring is beige-brown in color that is slightly contrasting with the décor of the room, but perfectly suits the ambiance. 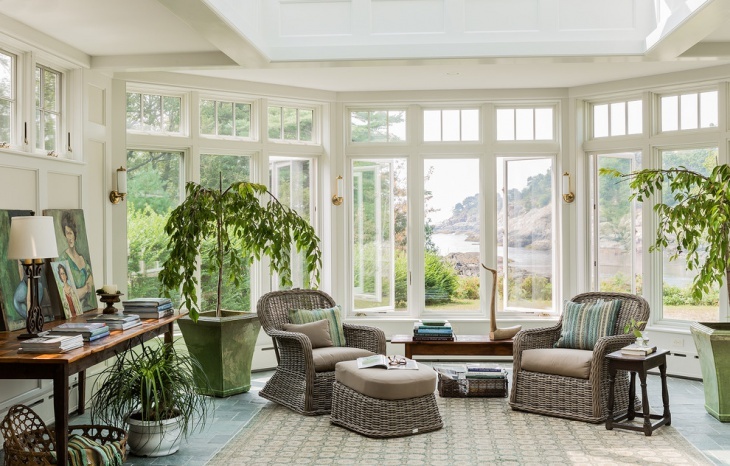 This is a rustic themed sunroom which has dark shades of furniture alongside the glass walls to enjoy the beauty of greenery outside. 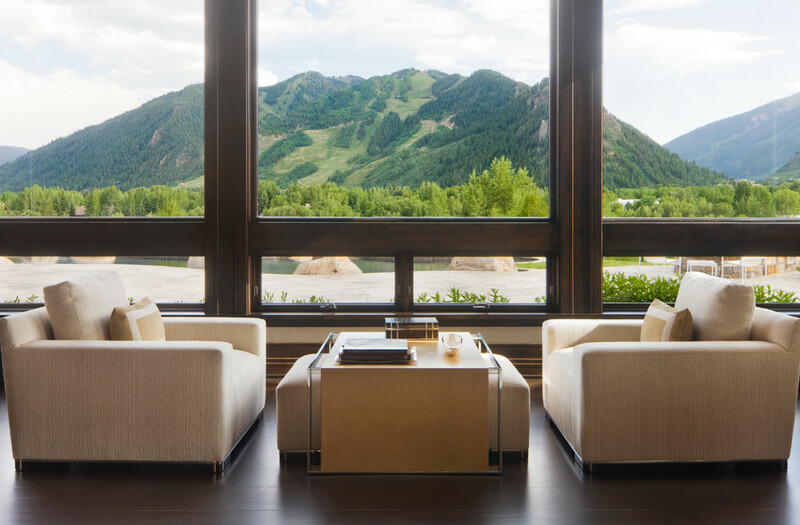 Since the furniture is dark, the greens and outside view is more prominently visible. 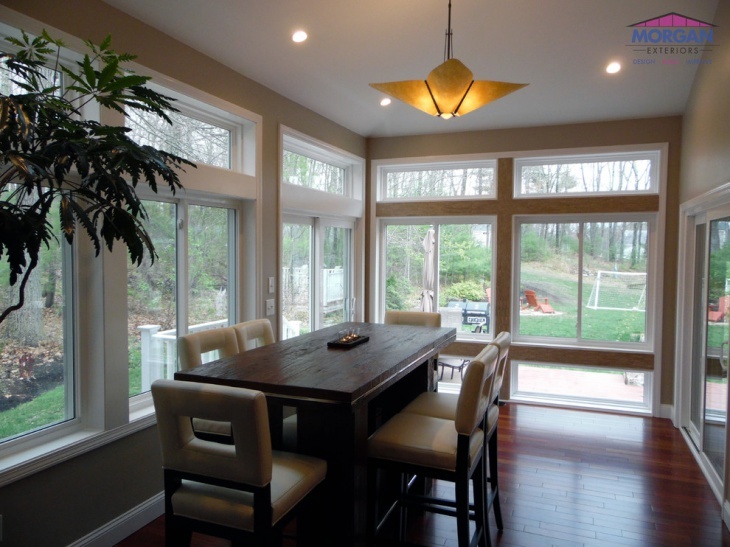 It contains dark hardwood flooring and standard ceiling with one hanging light. 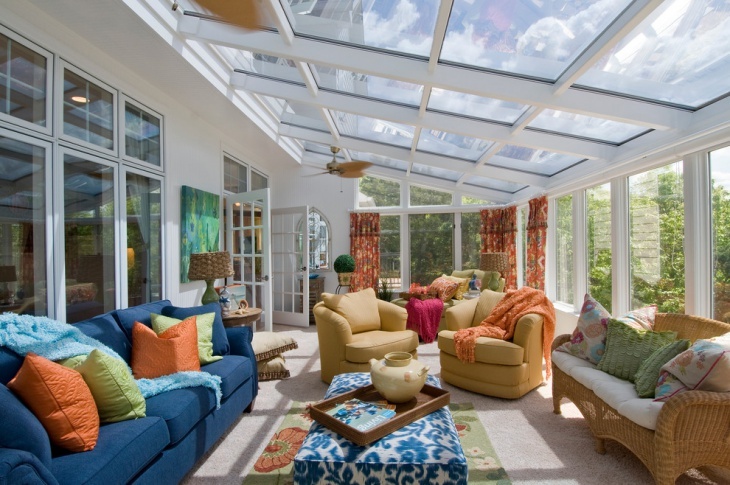 Sunrooms are great for spending quality time with our loved ones. 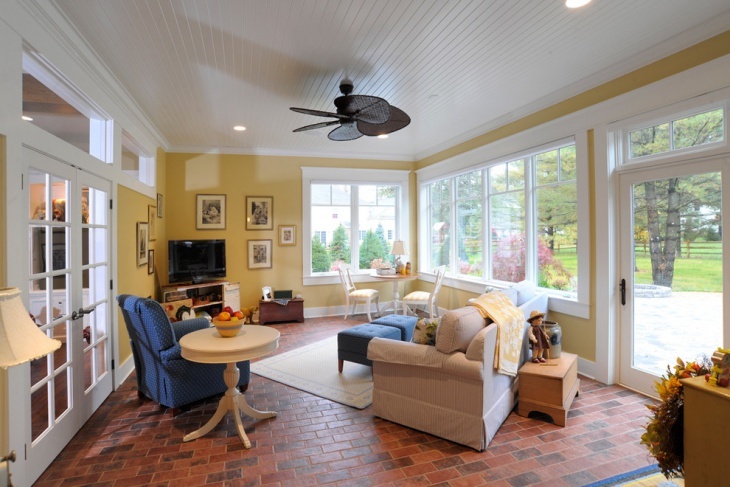 These rooms are perfect to give us the feel of a farmhouse even if built inside of our house. 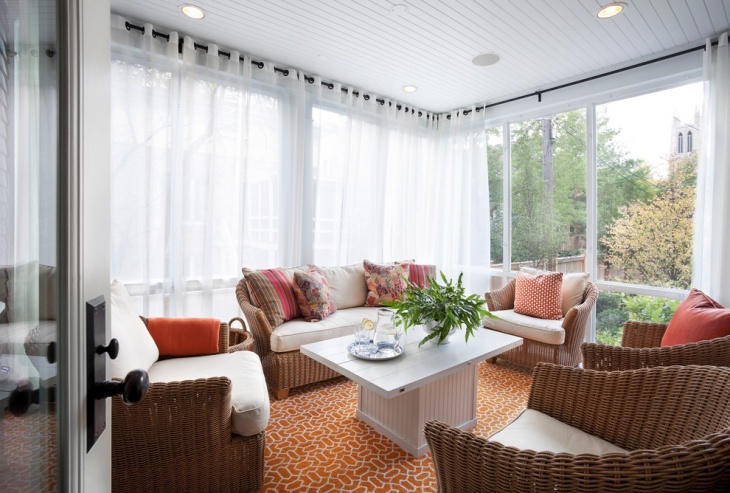 Without doubt, sunroom is the perfect place for relaxation, spending quality time with friends or perhaps just reading a book.